This addition to the robust canon of books on Tuscan cuisine appears rather late: the Tuscany boom is, some might say, ""so 1990s."" Still, Mandola and Carrabba, two ""Sicilian boys from Texas,"" are in love with the region's fare. This is their third cookbook (after Ciao Y'all and Ciao Sicily), and it praises Tuscany's rustic culinary pleasures. 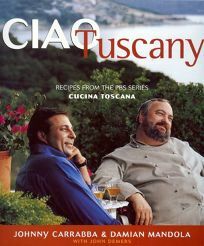 In bubbly prose, the hosts of the PBS cooking series ""Cucina Sicilia!"" offer an array of appetizers, soups, pastas, main dishes, side dishes and desserts drawing on the area's specialties: hearty breads, olives, cannellini beans, polenta and risotto. Corny commentary from ""D"" and ""J"" accompanies the recipes, varying from helpful (an explanation of what vin santo is) to pointless (""Your kitchen will be an Italian restaurant in no time""). The text can be confusing (in one side note, Mandola tries to explain the phrase ""under oil,"" but that phrase is nowhere to be found--in English, at least--in the recipe he refers to), yet delicacies abound. Recipes for Deep-Fried Sage Leaves, Asparagus Risotto, Mussels Steamed in White Wine, Tuscan Stuffed Pasta, Skewered Pork and Stuffed Zucchini will draw home cooks in, and the numerous color photos are an added enticement.